The Sharks received some good news regarding center Joe Thornton. Although he was placed on injured reserve with knee troubles, head coach Peter DeBoer told Paul Gackle of the Bay Area News Group that the issue is actually an infection on his surgically repaired knee and not an actual injury. He’s expected to be placed on antibiotics and if that clears up his swelling, he shouldn’t be out of San Jose’s lineup for too long. Considering how much time he has missed with that knee issue last season, that’s a huge relief for the Sharks. The Stars should have winger Valeri Nichushkin available for Tuesday’s game against Toronto, notes Matthew DeFranks of the Dallas Morning News. He suffered a lower-body injury partway during the preseason and has been out of the lineup since then. When he does make his debut, however, it may be on a lower line than expected; although he was on the second line before the injury, head coach Jim Montgomery likes the look of the current lineup. Nichushkin is returning to the NHL following a two-year stint with CSKA Moscow of the KHL. Colorado may be without winger Gabriel Landeskog for tomorrow’s game in Columbus, reports Mike Chambers of the Denver Post. He missed practice today due to a lower-body issue and if he’s unable to go, center Vladislav Kamenev could make his season debut after being recalled on Sunday. Meanwhile, Chambers adds that Avalanche defenseman Patrik Nemeth is expected to be cleared for contact on Tuesday and could return to action later this week. They are carrying one player under the maximum roster size at the moment so they won’t need to make a corresponding roster move when they activate him off injured reserve. Patrik is a big, physical defenseman who is an important piece of our D-corps. He plays a significant role on our penalty kill, he blocks shots, and we’re happy to have him back this season. 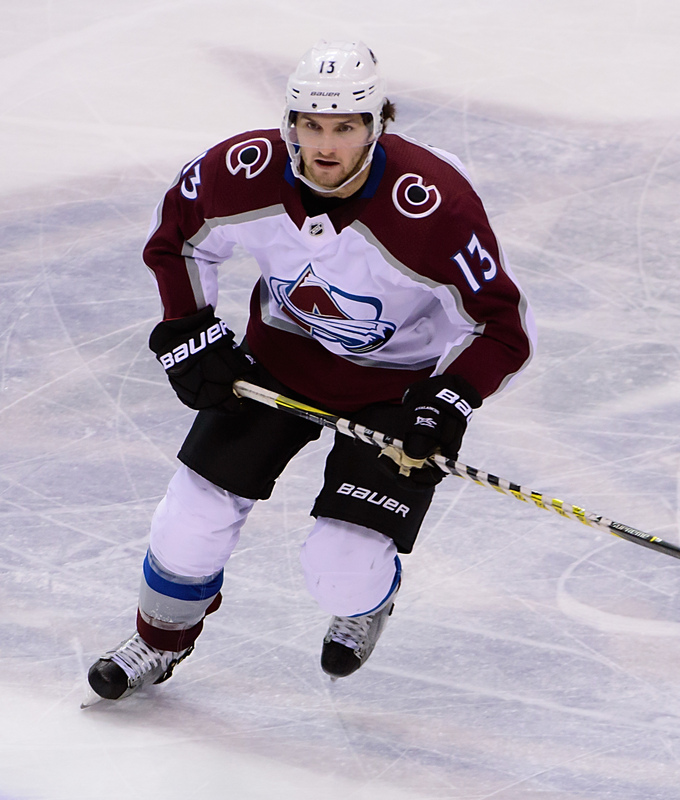 Nemeth came to the Avalanche last October when the Dallas Stars placed him on waivers just before the season began, and became a key part of the Colorado defense. In 68 games he was finally given a reasonable opportunity to show what he could do at the NHL level, logging more than 19 minutes a night and anchoring a penalty kill unit. Though Nemeth doesn’t have a ton of offensive upside, he still recorded 15 points for the Avalanche and easily led the club with a +27 rating. He was also first on the team in blocked shots with 185, which put him fifth in the entire NHL. Even with the surprise performance in 2017-18, there’s no guarantee that Nemeth has a long future in Colorado. With Erik Johnson still under contract for the next five years, Ian Cole signed to a new three-year deal, and Samuel Girard just starting out what looks to be a very promising career there aren’t going to be that many spots on the blue line going forward. Those spots may end up going to other young players like Cale Makar and Conor Timmins before long, and there is always still a chance that Nikita Zadorov reaches his full potential and demands more than 20 minutes a night as a shutdown option. For Nemeth—and even Tyson Barrie, who has two years left on his current deal—there may not be a lot of opportunity in Colorado. That said, a one-year $2.5MM contract gives Nemeth the chance to prove he deserves a long-term deal. Whether that deal comes with Colorado or someone else on the open market, another solid penalty killing performance this season could make him an intriguing option. Still young enough to contribute for several years, and likely still demanding a reasonable price, Nemeth could be a solid third-pairing addition to many clubs around the league. That hinges on his 2018-19, meaning he’ll have to continue to work hard and prove he is a reliable NHL defenseman. Adrian Dater of BSN Denver was first to report on the contract, while CapFriendly provided the financial details. The Arizona Coyotes will retire the first number in the history of their franchise when they raise Shane Doan’s #19 sweater to the rafters this season. The ceremony will take place on February 24th, fittingly against the Winnipeg Jets where Doan started his career. Doan’s Jets turned into the Coyotes after just one season in Winnipeg, and he would spend the next two decades growing the game of hockey in an extremely non-traditional market. His influence on the Coyotes was obvious, recording 972 points in 1,540 career games and serving as captain for more than a dozen seasons, but his legacy may best be remembered by the players that come after him. Auston Matthews is already a star in the NHL, and credits Doan as one of the biggest reasons he wanted to become a hockey player in the first place. Craig Custance of The Athletic tweets that there is no contract imminent between the Vegas Golden Knights and restricted free agent William Karlsson, meaning his August 4th arbitration hearing is still scheduled. Karlsson is an incredibly difficult case to handicap, after exploding for 43 goals and 78 points this season despite scoring just 15 and 45 over his first two NHL seasons. The Golden Knights have already handed out several long-term contracts to players they deem core pieces, and could still work something out with Karlsson over the next few days. Adrian Dater of BSN Denver reports (subscription required) that the Colorado Avalanche will announce a settlement with Patrik Nemeth today, avoiding his arbitration hearing on Saturday. Nemeth was one of just three players left with a hearing on the books after Cody Ceci and Gemel Smith met with the arbitrator today, though was still outside the period where a salary ask was required to be submitted. After finding himself in an increased role with the Avalanche this season, Nemeth recorded 15 points in 68 games and was a key part of their penalty kill. We’re getting closer to turning the calendar over to August, and there is still a lot of work to do for teams around the NHL. 10 arbitration cases remain unsettled, including for star players like William Karlsson and Mark Stone. Both will be extremely interesting to follow, as their respective teams have tough decisions on their hands. For the Vegas Golden Knights, do you hand out a long-term expensive contract to a player that is still relatively unproven. Though Karlsson scored 43 goals this season he had just 18 career tallies beforehand, and finished this season with an impossible 23.4% shooting percentage. There is almost no chance that he can maintain that rate going forward, meaning his huge 2017-18 season may be a career-high. On the other side of that coin though is the increased opportunity he was given after switching teams, which could provide a realistic chance for him to be a 30-goal, 65-point player going forward. Signing him now would likely get you a bit of a discount on that type of scoring threat, though Vegas would assume almost all of the risk. In Ottawa, there’s no clear direction on how the team will deal with Stone’s impending unrestricted free agency. Obviously one of the team’s most talented players, an arbitration award of one year would stop the Senators from negotiating with Stone’s camp until January on any potential extension and could make him a prime trade candidate. The 26-year old posted his fourth consecutive 20-goal season in 2017-18 despite playing in just 58 games. With all the turmoil in Ottawa it could be difficult to convince him to stick around long-term. Beyond the arbitration cases though there is an incredible amount of talent left on the RFA board. Dylan Larkin, William Nylander, Sam Reinhart, Shea Theodore, Josh Morrissey and many others remain unsigned and could all be looking at expensive long-term deals with their respective clubs. These players are already excellent players in the NHL before they’ve even become eligible for arbitration and could really grind the offseason to a halt if they decide to hold out. There’s no indication that anyone is planning a long negotiation, but we’re now almost a month into the signing period without any deals. Almost four dozen players decided to file for salary arbitration this summer, and while some of them have already been signed to contracts many others now know when their hearing will take place. The NHLPA released the full schedule of hearings, spread out from July 20th to August 4th. Remember that players can sign up until an arbitrator awards a contract, including in the short window after the hearing. Jacob Trouba – Team filing: $4.0MM, Player filing: $7.0MM. Awarded one-year, $5.5MM contract. Brett Kulak – Team filing: $650K, two-way contract, Player filing: $1.15MM, one-way contract. Awarded one-year, $850K contract. Cody Ceci – Team filing: $3.35MM, Player filing $6.0MM. Awarded one-year, $4.3MM contract. Gemel Smith – Team filing: two-way contract, Player filing: $900K. Awarded one-year one-way, $720K contract. The Colorado Avalanche are down to one restricted free agent remaining – defenseman Patrik Nemeth – after announcing three contract extensions today with RFAs. Goaltender Spencer Martin, defenseman Ryan Graves, and defenseman Mason Geertsen, whose deal had already been leaked, have all signed one-year contracts for upcoming season. Financial terms were not disclosed. 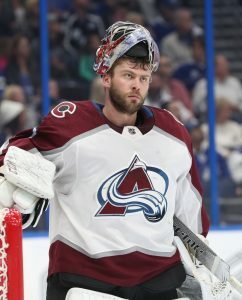 Martin, the most well-known of the trio, has been a mainstay in net in the minors for the Avalanche for the past few years. Martin has made 84 starts for the AHL’s San Antonio Rampage over the past two seasons as well as three NHL appearances. Martin’s numbers at both levels are rather pedestrian, but the 23-year-old was Colorado’s top goaltender prospect until the team used a third-round pick on big Finnish keeper Justus Annunen this June. 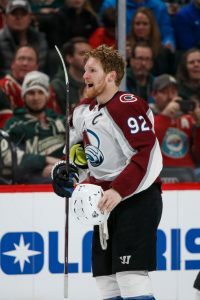 Between losing that title and the team’s additions of Philipp Grubauer and Pavel Francouz in net, Martin is facing a big season in 2018-19 with his relevance in the Avs’ system in doubt. Graves, 23, was just recently acquired by Colorado at the trade deadline in a swap of defensive prospects with the New York Rangers. The big blue liner was a 2013 fourth-round pick who has produced well in the AHL to this point in his pro career, but has yet to get a shot at the NHL. Graves is far from a polished prospect but still has some upside to his game that brings both physicality and play-making ability. Like Graves, Geertsen has also failed to make it to the highest level yet in his career. Similar to Graves in size and experience, at 23 Geertsen still lacks a pro-caliber offensive game. Last season was his first spent entirely in the AHL, as Geertsen has previously spent extensive time in the ECHL. Even though he wound up settling for a league minimum contract, new Blue Jackets winger Anthony Duclair received a fair amount of interest around the league. His agent, Phillipe Lecavalier, told Aaron Portzline of The Athletic (subscription required) that more than a third of the league showed some interest in the 22-year-old with about half of those tendering contract offers (including at least one offering more money). Duclair wound up picking Columbus in part based on a conversation with former NHL player Vincent Lecavalier, who played for head coach John Tortorella in Tampa Bay in the early 2000s. If he fares well in his new home, the Blue Jackets will be able to tender him a pretty cheap qualifying offer next summer. Avalanche defenseman Patrik Nemeth may not be ready for the start of training camp following multiple offseason shoulder surgeries, GM Joe Sakic told Mike Chambers of the Denver Post. The 26-year-old is Colorado’s last NHL restricted free agent and is coming off of a career year that saw him post 15 points (3-12-15) in 68 games while logging just shy of 20 minutes of ice time per game. Nemeth was among the group that filed for salary arbitration earlier this week and is one year away from UFA eligibility. Although his signing largely went under the radar, new Sharks center Antti Suomela was one of the more sought-after players so far this offseason. Paul Gackle of the Bay Area News Group notes that San Jose beat out roughly a dozen teams to secure the services of the 24-year-old which may result in them ensuring that he receives an NHL spot to start next season. Suomela is coming off a strong season in Finland where he led the SM-liiga in scoring with 60 points in 59 games.